Virgin Atlantic Airways has always had an independent approach and part of the carrier's DNA is giving British Airways a run for its money. But competing with its larger archrival is becoming increasingly difficult as British Airways (BA) has considerably enlarged its London Heathrow slot portfolio through the acquisition of bmi, giving it more scope to grow at the congested airport. BA also benefits from antitrust immunity with its oneworld partners on trans-Atlantic routes. Passenger growth at Virgin Atlantic has stalled as economic uncertainty has settled over Europe. The company accrued a pre-tax operating loss of GBP80.2 million in its latest fiscal year ending 28-Feb-2012, reversing a GBP18.5 million profit recorded in the previous 12 months. Revenue for the company, which includes Virgin Atlantic Airways and tour operator Virgin Holidays, rose 3% year-over-year in FY2012 to GBP2.74 billion but, as CEO Steve Ridgway noted, “with the prevailing uncertainty in the economy, sky high fuel prices and a 25% hike in our air passenger duty fees, converting this sales growth into profit has not been possible”. The UK has an astronomical high Air Passenger Duty (APD) and this has been rising despite protests from the industry. The latest increase took effect on 01-Apr-2012 following on a steep increase on 01-Nov-2010, and the tax now can be as high as GBP130 for a flight in business class to the US and GBP162 to India for passengers departing from a London airport. Virgin’s ADP collection increased by 25% to GBP195 million in FY2012. Virgin Atlantic had hoped to develop into a fully-fledged network carrier by combining its own point-to-point long-haul network with bmi’s short and medium-haul at Heathrow; however, these ambitions were definitely dashed when Lufthansa in Dec-2011 opted to divest its UK subsidiary to British Airways’ parent company International Airlines Group (IAG). The deal was formally closed in Apr-2012 and IAG is in the process of integrating bmi into BA’s mainline operations at Heathrow. Virgin has made previous efforts to acquire bmi prior to Lufthansa taking control of the carrier. During Virgin Atlantic's 25th anniversary in 2009, some insiders speculated about a broader tie-up with Lufthansa, possibly including an investment in Virgin in conjunction with the Lufthansa's acquisition of bmi. More rumours about a change in strategy and ownership at Virgin Atlantic followed in 2010 when both Mr Ridgway and Virgin Atlantic president Sir Richard Branson said the company might be open to consolidation. Sir Richard’s Virgin Group holds 51% in Virgin Atlantic Airways while the remaining 49% is held by Singapore Airlines Group, which has publicly admitted on several occasions that its shareholding in the UK carrier is no longer of strategic value and it is looking at several options, including a divestiture. It bought the stake in 1999 for GBP600.25 million. Virgin Group contracted Deutsche Bank in 2010 to assess the airline's position and growth opportunities in the rapidly consolidating European airline industry. A possible entry in an alliance was also reportedly on the agenda with Star Alliance as the preferred option, although SkyTeam was also mentioned a possibility. There have also been rumours about a combination with easyJet, as both Virgin Atlantic and the LCC have a base at Gatwick Airport and the tie-up would provide a powerful antidote for BA’s new ambitions at the London airport. However, so far Virgin has remained true to its independent routes, and it continues operating as a non-aligned, customer-centric point-to-point airline looking to grow organically. 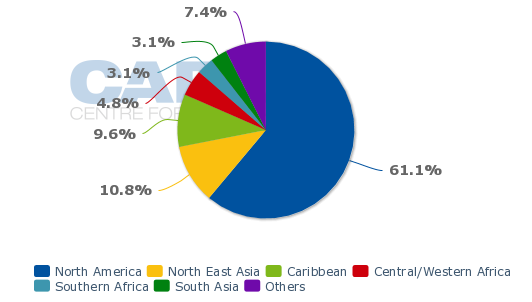 The airline operates the vast majority of its weekly seat capacity on routes to North America. Its network spans 33 non-stop passenger destinations of which 11 are in North America, eight in Central America and the Caribbean, four in Africa, one in the Middle East and eight in the Asia-Pacific region. Virgin commenced two new routes with the introduction of its summer schedule, a four times weekly seasonal route from London Heathrow to Vancouver that launched 24-May-2012 and a twice weekly service from London Gatwick to Cancun that began on 07-Jul-2012. New service to Mumbai from Heathrow is scheduled to begin in Oct-2012. The carrier has also announced its intent to add Moscow to its network, and will partner with Russian carrier Transaero through a codeshare on the service. Virgin also plans to cut flights from Heathrow to Nairobi on 24-Sep-2012. According to schedules in the GDS, new daily service offered by Virgin to Mumbai is being operated with new A330-300s. The airline in Apr-2011 took delivery of its first A330 as part of a 10 aircraft order. Four of the jets have already joined the fleet and the remaining six are scheduled for delivery this year. The A330s are Virgin’s first twin-engined widebody aircraft in its history, and will gradually replace its less fuel efficient A340s and Boeing 747s. Virgin acquired the A330s to fill the capacity gap created by the delays in the Boeing 787 programme. The company announced an order for 15 787-9s, plus options for an additional eight 787-9s and purchase rights for an additional 20 787s, in Apr-2007, and its first Dreamliner was initially planned for delivery in 2011. 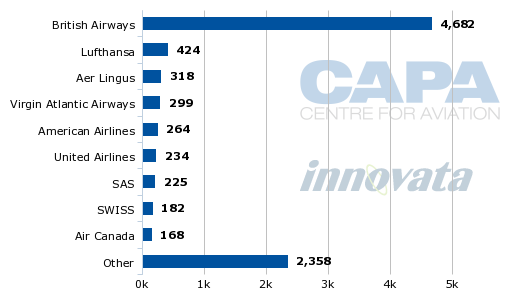 Now the carrier will not receive its first 787 before 2013. The airline also has six A380s on firm order and deliveries of these aircraft have been delayed several times. Virgin Atlantic's first A380 was scheduled for delivery in 2009, but the carrier has pushed out first delivery to 2015. Virgin Atlantic operates from four UK airports, but its main operating base is at London Heathrow. It operates some 97,000 seats per week from Heathrow, 31,000 from London Gatwick and just under 10,000 from Manchester, according to schedules in Innovata for the week of 06-Aug-2012 to 12-Aug-2012. It operates a single route from Glasgow International Airport, a once weekly flight to Orlando International. The company strives to have balance between leisure flying out of Manchester and Gatwick supported by Virgin Holidays and a more business-oriented offering out of London Heathrow. The airline has always argued that BA has a dominant position at the airport and it has fiercely, although unsuccessfully, lobbied against the antitrust immunity enjoyed by BA and its oneworld partners, primarily American Airlines, on trans-Atlantic routes. In addition, BA, American and Iberia have a joint-venture agreement to share revenue, coordinate networks and schedules and cooperate commercially on routes between the EU, Norway and Switzerland and the US, Canada, Mexico and US territories. Virgin has also objected the regulatory approval of BA’s purchase of bmi, which it claims “will cause serious competitive damage at Heathrow, placing British Airways in a position of total market dominance at the world’s busiest airport and completely eroding consumer choice”. Sir Richard has said Virgin wants to take up to 12 of the 14 daily slot pairs that BA has to surrender as part of obtaining the European Commission’s approval for the bmi acquisition. Two daily slot pairs have already been leased to Transaero Airlines for use on flights to Moscow. BA indeed is the dominant carrier at Heathrow and offers about 820,000 seats per week from the airport. 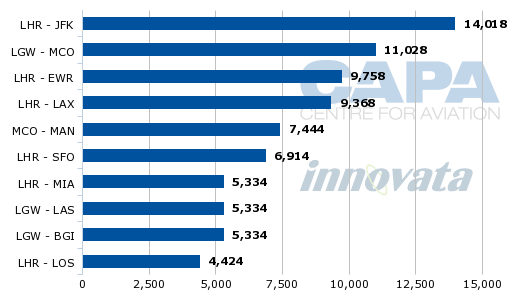 This gives it a 46% capacity share whereas Virgin is the second largest carrier in terms of weekly seat capacity with a mere 5% share, according to Innovata. In terms of flight movements, the distance between Virgin and its archrival is even larger. 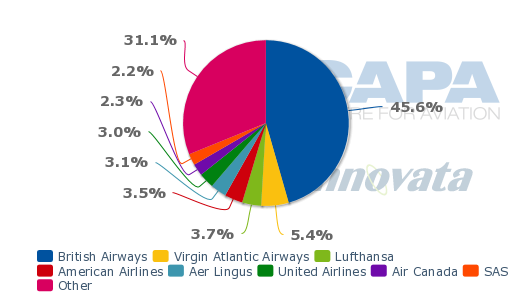 BA operates 51% of all incoming and departing flights from Heathrow while Virgin takes only a fourth position with less than 5%. Virgin operates approximately 300 flights per week and BA, which has a large short and medium-haul network feeding its long-haul, operates almost 4700 weekly flights. Virgin Atlantic Airways has inherited the role of challenger to BA on long-haul routes following the failure of Laker Airways in 1982, two years before Virgin took off. Many squabbles have marked their relationship since, and include BA’s “dirty tricks” campaign in the 1990s and the price-fixing scheme involving passenger fuel charges on trans-Atlantic routes between 2004 and 2006. Virgin tipped off regulators and was not penalised financially for participating, but BA was fined by the UK Office of Fair Trading as well as the US Department of Justice. Not coincidentally, Virgin competes with BA on most of its routes and all but one of its 10 largest routes. As BA does not operate long-haul from Manchester, Virgin is relieved from a British Airways presence on its Manchester-Orlando International Airport service, which it operates aboard its new A330-300 with a daily frequency. Virgin also operates from Manchester to Las Vegas McCarran International and to Bridgetown. BGI = Bridgetown Grantly Adam International Airport; LOS = Lagos Airport. Mr Ridgway said the carrier had an “encouraging” start to the year with airline revenues up 5.8% to GBP481.9 million in 1QFY2013 compared to the year-ago period and an increase in passenger numbers up 2.3% to 1.3 million. The company initiated a programme to reduce operating costs by GBP50 million and has simultaneously committed to pursuing a GBP100 million product Upper Class product investment, which it launched in Feb-2012. For Virgin Atlantic it is life as usual as it attempts to grow in a challenging market dominated by a much larger airline. Thus far, its niche strategy has proven to be viable yet rumors continue as to whether the airline might be sold, forge a tie-up with a Middle East carrier and/or align itself with an alliance.